It's now 62 days until the kickoff of Catamount football at Georgia Tech. We'll keep the spotlight on the Offensive Line on the Catamount Sports Forum, and highlight redshirt junior Nathan Postelle. Click the link below for more information on Nathan. It's now 63 days until the kickoff of Catamount football at Georgia Tech. We'll keep the spotlight on the Offensive Line on the Catamount Sports Forum, and highlight College of the Sequoias transfer Olukayode Akinmoladun. Click the link below for more information on Olukayode. It's now 64 days until the kickoff of Catamount football at Georgia Tech. 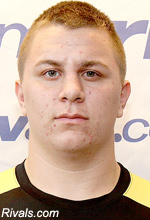 We'll keep the spotlight to the Offensive Line on the Catamount Sports Forum, and highlight freshman Tyler Philpott. Click the link below for more information on Tyler. With the end of the fiscal year 2011 rapidly approaching on June 30, the Catamount Club and Western Carolina athletics continue to need the support of each of its fans and supporters to reach the goal of raising $500,000 towards the Catamount Athletic Scholarship Fund. Contributions made to The Catamount Club will directly impact scholarships that support each of WCU's 16 intercollegiate sports. We challenge you to help us reach 1000 active members by recruiting a new member to the Catamount Club today! For as little as $8.33 a month, you can recruit a friend to become an active member of the Catamount Club! The closing days before the end of the financial calendar are critical as the Catamount Club strives to reach its goal of 1,000 members and $500,000 to the Catamount Scholarship Fund. The organization has currently received over $360,000 to date towards the Catamount Scholarship Fund with membership renewals arriving daily. By enrolling at the Coaches Club Level, ($1,850) it ensures the donor a designated tailgate spot in the stadium parking lot next to E. J. Whitmire Stadium / Bob Waters Field. The Tailgate Parking Selection Event will take place on August 13 in conjunction with preseason Catamount Football practice. Western's first conference road game comes as the Catamounts travel to Statesboro, Ga. to Paulson Stadium to meet Georgia Southern for the 22d time. The Cats will face the triple option offense for the second time in three games in this young football season. GSU currently owns a 19-2 overall record against the Catamounts. Jeff Monken enters his second season as head coach of the Eagles, coming off an initial 10-5 season, going 3 games deep into the NCAA Div. I football playoff series. In Monken's initial season as a head coach, he defeated 5 ranked teams, and lead the Eagles into the FCS playoffs for their first appearance since 2002. The Eagle have a total of 48 letterwinners returning (19 on offense, 25 on defense, & 4 on special teams) which includes a total of 23 starters returning from the 2010 team (all 11 on offense, 9 on defense, & 3 on special teams). Jaybo Shaw will again be leading the Eagles at quarterback. Shaw throw for over 1200 yards last season, including 5 touchdowns, rushing for 514 yards and 16 touchdowns. Running back Robert Brown rushed for 1,004 yards, averaging 4.7 yards per carry. Returning senior and cornerback Laron Scott set two school records in 2010, the single season record for interceptions, & for kick off returns (yardage). It's now 65 days until the kickoff of Catamount football at Georgia Tech. We'll keep the spotlight to the Offensive Line on the Catamount Sports Forum, and highlight redshirt junior Teddy Rhoney. Click the link below for more information on Teddy. It's now 66 days until the kickoff of Catamount football at Georgia Tech. Click the link below for more information on Steven. The Southern Conference announced the Academic All-Conference team for the 2011 spring season and Western Carolina paced the league schools with 34 members named to the team. Overall, Western Carolina has a total of 81 student-Athletes named to the entire 2010-11 SoCon Academic All-Conference Teams for fall, winter and spring. See a complete list of the names of Western's spring Academic All-Conference Team on the Catamount Sports Forum. July 20, 2011 -The WCU/Hayesville Golf Outing - The Ridges Golf Club, Hayesville, N.C.
August 3, 2011 - The Western Open - Waynesville Inn, Golf Resort and Spa, Waynesville, N.C.
September 9, 2011 - The Bob Waters Memorial - High Vista C.C., Mills River N.C.
October 10, 2011 - The Catamount Golf Tour Championship - Kenmure C.C, Hendersonville, N.C.
To register for one-or-more of these events or for more information please contact the Catamount Club Office at (828) 227-3047 or email at bradley@wcu.edu. It's now 67 days until the kickoff of Catamount football at Georgia Tech. We'll return the spotlight to the Offensive Line on the Catamount Sports Forum, and highlight redshirt sophomore Matt Hastings. Click the link below for more information on Matt. Head Women's Basketball Coach Karen Middleton announced the 2011-12 schedule on Friday, June 24th. This season includes a total of 14 home games out of the 29 scheduled overall. The Cats open the season on November 4th in an exhibition game against Mars Hill, and opens Southern Conference play on December 3, hosting Davidson in the Ramsey Center. "This season, our team will be young and hungry as we look to build on last year's tournament win, we are poised and ready to compete for a championship," Middleton stated. "This will be an exciting season, and we look forward to watching the growth of our team as the season progresses." It's now 68 days until the kickoff of Catamount football at Georgia Tech. We'll keep the spotlight on the Defensive Line on the Catamount Sports Forum with freshman Caleb Mobley. Click the link below for more information on Caleb. It's now 69 days until the kickoff of Catamount football at Georgia Tech. We'll keep the spotlight on the Defensive Line on the Catamount Sports Forum with freshman defensive tackle Brent Samuels. Click the link below for more information on Brent. Catamount Club in final weeks for 2010-2011 Campaign Goals: $500,000.00 and 1000 Members! Each of these goals are significant increases from last year, however, through a surge in new members in recent months, we are confident we will achieve each of these goals by June 30th, 2011 through your continued support of WCU Athletics. We challenge you to help us reach 1000 active members by recruiting a new member to the Catamount Club today! For as little as $8.33 a month, you can recruit a friend to become an active member of the Catamount Club! Thank you to each of you that have renewed your membership and recruited new members to our organization as we strive to fund scholarships for each of the student athletes at Western Carolina University. It's now 70 days until the kickoff of Catamount football at Georgia Tech. We'll return the spotlight to the Defensive Line on the Catamount Sports Forum with RS Sophomore Aaron Woller. Click the link below for more information on Aaron. It's now 71 days until the kickoff of Catamount football at Georgia Tech. #71 is not assigned at this time. It's now 72 days until the kickoff of Catamount football at Georgia Tech. We'll continue the spotlight of the Offensive Line on the Catamount Sports Forum with RS Sophomore Vince Williams. Click the link below for more information on Vince. A preseason preview of the Catamount's second opponent of the 2011 football season, the Lions of Mars Hill College. The Catamount's first home opponent is a familiar one, the South Atlantic Conference's (SAC) own Mars Hill College (MHC). Head Football Coach Tim Clifton's Div. II Lions were 5-6 overall in the 2010-11 football season, and did earn a 45-39 Homecoming victory over Tusculum last season, which won in Cullowhee. The Lions finished 5th overall in the SAC. Clifton's 87 football wins in his 18 seasons at MHC, place him third in all-time wins of all SAC head coaches. The Lions will return 6 starters from their offense, 6 on defense, and 5 on special teams, including their third leading point scorer, place kicker Michael Pinkerton. The Lions will be lead by Clemson transfer RS junior quarterback Jon Richt. In the 2010 season, Richt passed for 20 TD's, and completed 131 passes for 2,238 yards. Richt's favorite target was senior wide receiver P.J. Gore, who had 9 TD catches and averaged 99 yards per game. Richt is not a threat rushing, gaining only 37 yards total last season on the ground. Richt is the son of University of Georgia Head Football Coach Mark Richt. Jonas Randolph, a 5-10, 185-pound senior running back, was the teams leading scorer last season, with 15 touchdowns, and 1367 yards rushing (avg 124 per game). Randolph has been selected to the 2011 Lindy's Sports Magazine preseason All-American second team. After the 2010 season, Randolph was named a D2football.com All-American; Honorable Mention All-American by Don Hansen; named to the American Football Coaches Association (AFCA) Division II Coaches’ All-America Team; Daktronics All-Southeast Region and All-South Atlantic Conference first teams. Randolph led the SAC in rushing for two consecutive seasons, and through the last three seasons, has 37 touchdowns, 3,438 rushing yards and 222 points scored, all MHC career records. Of interest is the size of the 2011 signing class for Mars Hill. Their 2011 signing class includes a total of 73 players, that's 73 new players, not counting returning players. While the Catamounts will win this game, the Lions should not be taken lightly, they will come to Cullowhee remembering Tusculum. It's now 73 days until the kickoff of Catamount football at Georgia Tech. We'll continue the spotlight of the Offensive Line on the Catamount Sports Forum with RS Sophomore Wesley Cook. Click the link below for more information on Wesley. It's now 74 days until the kickoff of Catamount football at Georgia Tech. #74 is not currently assigned, so we'll continue the spotlight of the Offensive Line on the Catamount Sports Forum with someone that could be assigned #74, Merced College, Admir Mujakovic. Click the link below for more information on Admir. Junior infielder Ross Heffley was named First Team All-America at second base by the National Collegiate Baseball Writers Association (NCBWA). Heffley is just one of three baseball players from the SoCon selected for the first team, he is joined by Charleston third baseman Matt Leeds and Georgia Southern outfielder Victor Roache. Charleston freshman outfielder Daniel Aldrich was named to the second team. It's now 75 days until the kickoff of Catamount football at Georgia Tech. #75 is not currently assigned, so we'll the continue the spotlight of the Offensive Line on the Catamount Sports Forum with someone that could be assigned #75, College of the Sequoias transfer, Marquis Gray. Click the link below for more information on Marquis. It's now 76 days until the kickoff of Catamount football at Georgia Tech. #76 is not currently assigned. It's now 77 days until the kickoff of Catamount football at Georgia Tech. To help pass the long summer days until football season starts, and hopefully get the Catamount faithful a little more excited about the upcoming season, we'll continue the 100 day football countdown with day 77, looking at the Offensive Line and spotlighting #77 Dan Polaski. Click the link below for more information on Dan on the Catamount Sports Forum. It's now 78 days until the kickoff of Catamount football at Georgia Tech. To help pass the long summer days until football season starts, and hopefully get the Catamount faithful more excited about the upcoming season, we'll continue the 100 day football countdown with day 78, looking at the Offensive Line and #78 Ryan Moore. Click the link below for more information on Ryan. The Western Carolina 4x400m relay team was named to the U.S. Track & Field and Cross Country Coaches Association All-America Team. The team consists of senior Drew Tucker, junior Benny Davis, sophomore Brandon Hairston and freshman Aaron Tribble. The relay team finished 15th overall in the nation at the NCAA Division I Outdoor Championships. It's now 79 days until the kickoff of Catamount football at Georgia Tech. #79 is not currently assigned, so we'll spotlight on the Catamount Sports Forum someone that could be assinged #79, freshman Wide Receiver Isaiah Johnson. Click the link below for more information on Isaiah. It's now 80 days until the kickoff of Catamount football at Georgia Tech. Today we continue to spotlight the Catamount Wide Receivers, featuring #80 Jamil James, on the Catamount Sports Forum. Click the link below for more information on Jamil. It's now 81 days until the kickoff of Catamount football at Georgia Tech. Today we continue to spotlight the Catamount Wide Receivers, featuring #81 Colton Cox, on the Catamount Sports Forum. Click the link below for more information on Colton. A preseason preview of the Catamount's first opponent of the 2011 football season, the Georgia Tech Yellow Jackets. The Ramblin' Wreck football team fell to a 6-7 record last season, just the second losing season of WCU alumni Paul Johnson’s 14-year career as a head football coach. The Yellow Jackets may get enough wins in the 2011 season for a bowl bid, but are not expected to offer a significant challenge for the Coastal Division championship race in the Atlantic Coast Conference. Head Football Coach Paul Johnson is not just the Yellow Jacket head coach, he, like Dennis Wagner, is also their team's Offensive Coordinator (OC). Johnson will put the Catamount defense to a strong test with the first of four games this season against the difficult to defend, triple option offense. While turning out over 400 yards per game last season, Johnson's offense was not as effective as their 2009 season, as scoring was down and the team didn't complete the big plays in their passing game needed to complement a triple option rushing attack. Redshirt junior Tevinn Washington probably has the inside shot at the starting quarterback position (started the final four games in 2010), but will have some lively competition from redshirt freshman Synjyn Days. A big key in the offensive scheme will be who can (if anyone) step up and replace Anthony Allen, who rushed for over 1300 yards, as none of the backs replacing Allen have a lot of experience. Special Teams could be a problem for the Yellow Jackets this season, with the loss of senior kicker Scott Blair. Blair handled all three kicking position responsibilities last season. Justin Moore, the likely punter this season, showed control problems in his limited opportunities on kickoffs, and Chandler Anderson, the likely punter has never a punt in a college game. Defensive Coordinator Al Groh's defensive line is probably the most experienced unit in the Yellow Jacket's 3-4 defense. However, last season the defense only combined for 4 sacks and 12 tackles for a loss, and all four starters in the secondary must be replaced. The Yellow Jackets have been projected to finish about 4th in the Coastal Division of the ACC. It's now 82 days until the kickoff of Catamount football at Georgia Tech. Today we continue to spotlight the Catamount Wide Receivers, featuring #82 Daniel Crenshaw, on the Catamount Sports Forum. Click the link below for more information on Daniel. Head Basketball Coach Larry Hunter has released the 2011-12 Men's Basketball Schedule. With only one non-D1 out of conference game scheduled, the Catamounts have assembled a pretty good OOC collection of games. With games against NC State, South Carolina, Bradley, Purdue, and Kent State, the Catamounts have an opportunity to impress early in the season. Meet next season's Catamount Women's Golf Team. Four new student-athletes have been announced and the 2011-12 WCU women's golf roster has been posted on the athletic web site. The roster consists of 3 seniors, 2 juniors, and 3 freshmen. It's now 83 days until the kickoff of Catamount football at Georgia Tech. Today we continue to spotlight the Catamount Wide Receivers, featuring #83 Jeff Moore, on the Catamount Sports Forum. Click the link below for more information on Jeff. Junior second baseman Ross Heffley was named to the 2011 North Carolina Collegiate Sports Information Association (NCCSIA) University Division All-State Baseball Team . The All-State team consists of NCAA Division I student-athletes from NC colleges and universities, Ross is one of 3 student-athletes representing the SoCon, two were selected from Elon. Western Carolina University Campus Montage from Arledge Armenaki on Vimeo. It's now 84 days until the kickoff of Catamount football at Georgia Tech. Today we continue to spotlight the Catamount Wide Receivers, featuring #84 Will Roseborough, on the Catamount Sports Forum. Click the link below for more information on Will. The Catamount men's 4x400-meter team will compete today at the 2011 NCAA Outdoor Track & Field Championships held at the Drake Stadium on the campus of Drake University in Des Moines, Iowa. The team consists of freshman Aaron Tribble, sophomore Brandon Hairston, senior Drew Tucker and junior Benny Davis. It's now only 85 days until the kickoff of Catamount football at Georgia Tech. Today, on the Catamount Sports Forum, we continue to spotlight the Catamount Tight Ends, featuring #85 Andrew Rogers. Click the link below for more information on Andrew. Kyle was drafted today in the MLB draft by the Cardinals in the 23d round. 2011 (Redshirt Junior): Made 13 relief appearances on the season tossing 16.1 innings ... Struck out 22 against 15 walks ... Struggled with control early in the season after returning from off-season surgery, walking seven with four wild pitches in his first five appearances ... Only one of his seven hits allowed on the season went for extra bases ... Recorded at least one strikeout in all but three of his seasonal appearances ... WCU won six of the 13 games he pitched in ... His final two appearances of the season were his best, tossing 2.2 innings of one-run, one-hit relief in a 16-inning game against Furman (5/13) before keeping top-seeded Elon (5/25) off the board through a career-long 4.1 innings with a career-high six strikeouts in the epic 20-inning game against the Phoenix in the conference championship event. Matt was drafted today in the MLB draft, by the Pittsburgh Pirates in the 30th round. WCU Career Notes: Closed his four-year WCU career with an 11-8 overall record including a career-best nine wins as a junior ... Of his 58 career starts, 31 came as a starter ... His 174 career strikeouts rank him 18th in school history at the time of his graduation. 2011 (Senior): Made 14 appearances on the season with 13 coming in the starting role ... Led the team in both innings pitched (85.1) and strikeouts (70) on the season, posting a 4.01 ERA ... His 70 K's ranked him tied for 10th in the SoCon while his 26 strikeouts looking ranked him sixth in the league ... Opponents hit just .290 against him on the year ... Induced a team-high nine double plays on the season ... WCU won seven of the 14 games in which he pitched on the season ... Pitched at least 4.2 innings in all 13 starts, matching his career-long of eight innings three times during the season ... Missed his first scheduled start of the season on opening day against Morehead State (2/18), but earned the starting nod against Wake Forest (2/22) nearly picking up a 1-0 shutout victory before the squad fell, 2-1, in extra innings ... Made one relief appearance on the season coming against Manhattan (2/27) ... Struck out four-or-more batters nine times including fanning a career-high 13 in a road win over Davidson (3/25) ... Was a preseason first team All-Southern Conference selection as a starting pitcher. Meet next season's Catamount men's Golf team. The 2011-12 WCU men's golf roster has been posted. The roster consists of 2 juniors, 2 sophmores, and 3 freshmen. It's now only 86 days until the kickoff of Catamount football at Georgia Tech. Today we spotlight the Catamount Tight Ends, featuring #86 Taylor Spangler. Click the link below for more information on Taylor. It's now only 87 days until the kickoff of Catamount football at Georgia Tech. Today we spotlight the Catamount Wide Receivers featuring #87 Brandon DeCaro. Click the link below for more information on Brandon. Former Catamount track & field star Manteo Mitchell has signed a professional contract with the WAFEL Sports Management team out of Brussels, Belgium. "Mitchell finished his track & field career at WCU as one of the most decorated men's athletes in school history. A four-year varsity letter winner, Mitchell amassed over 30 All-Southern Conference accolades in both sprint and sprint relay events during his collegiate career." It's now only 88 days until the kickoff of Catamount football at Georgia Tech. Today we spotlight on the Catamount Tight Ends featuring #88 Junior Nate Stephenson. Click the link below for more information on Nate. It's now only 89 days until the kickoff of Catamount football at Georgia Tech. Today we continue the spotlight on the Catamount defensive line featuring #89 Sophomore Tyler Smith on the Catamount Sports Forum. Catamount junior Ross Heffley has been named to the first team Louisville Slugger NCAA Division I All-American baseball team announced by Collegiate Baseball. He is the 11th Catamount to receive All-America honors. Heffley led the SoCon with both a .419 batting average and a .483 on-base percentage and lead the Catamounts in batting average, home runs (11) and RBI (65). It's now only 91 days until the kickoff of Catamount football at Georgia Tech. Today we continue the spotlight on the Catamount defensive line featuring #91 RS Sophomore Brian Johnson on the Catamount Sports Forum. Click the link below for more information on Brian. 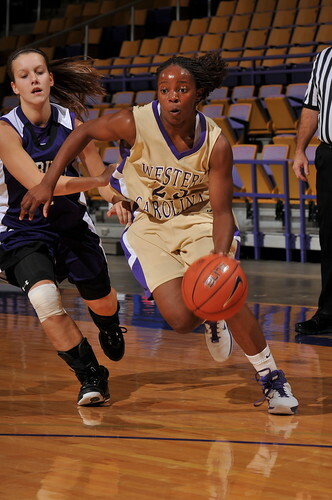 The 2011-12 WCU women's basketball roster has been posted. The roster consists of 3 seniors, 3 juniors, 4 sophmores, and 4 freshmen. It's now only 92 days until kickoff of Catamount football at Georgia Tech. Today we continue the spotlight on the Catamount defensive line featuring Santa Rosa Junior College transfer Andre Shishkin on the Catamount Sports Forum. Click the link below for more information on Andre.